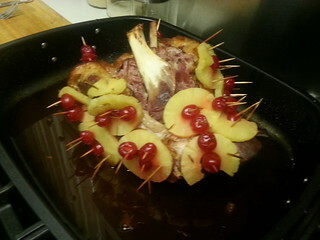 The ham was baked with pineapple and cherry to keep in nice and moist. This took about three hours. We then pulled in out and wrapped it up and foil. Next we cooked the brussels sprouts and potatoes. Both of which are really simple to make. 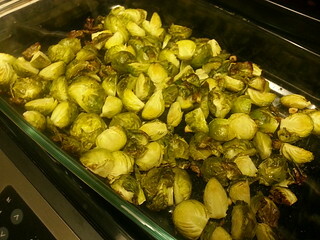 In 9×11 pan mix together brussels sprouts, oil, garlic and salt. Make sure the oil, salt garlic mixture covers the sprouts well. 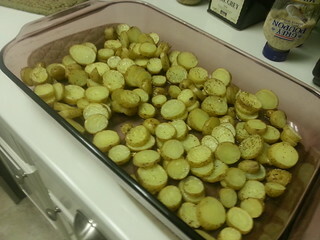 In 9×11 pan mix together potatoes, oil, garlic and salt. Make sure the oil, salt garlic mixture covers the potatoes well. 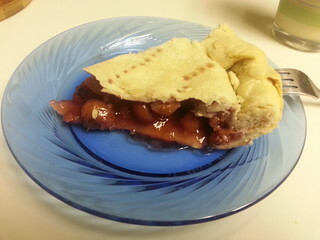 Lastly we had cherry pie for dessert. We used canned tart cherries and made sure to thicken the pie with instant tapioca. I thought it was just right in terms of sweeteness but my husband would have preferred it had been a bit sweeter.